The organizations with the strongest GRC capability have a little something extra – leaders who are committed to building agile, resilient, confident and competitive businesses. The most forward thinking of these leaders see that a well defined and integrated GRC capability is a key to this success. Just like the best coaches of elite athletes, today’s leaders need to stay on top of the latest tools and techniques. Sure, you can still use spreadsheets in siloed operations, just like a gymnast or hockey player or yacht racing team could still use 1960’s equipment and training methods. But where does that get you? Not to the performance levels needed to succeed in today’s competitive environment. Just like athletes and their coaches, today’s leaders need to be ahead of the curve with the best team, techniques, and resources to win. 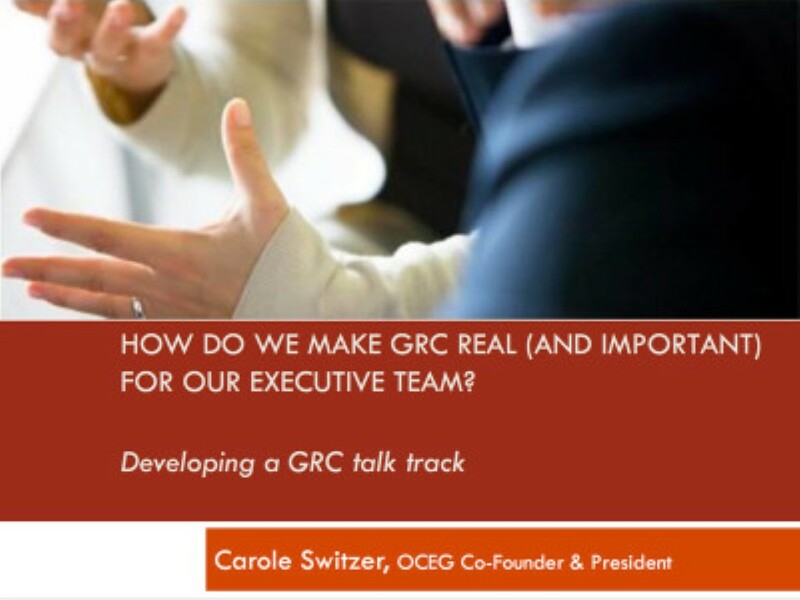 In this webcast, OCEG President Carole Switzer discusses how we should talk to our management teams and other influencers within our organizations about the competitive edge of an effective and mature GRC Capability. If you would like information on how OCEG can help you develop the right GRC Talk Track for your own organization, just email us at info@oceg.org. We have emailed instructions to access How Do We Make GRC Real (and Important) for Our Executive Team? Slide Deck to . Make sure the email arrives in your inbox: either add "support@oceg.org" as a safe sender to your email platform, or if you use Gmail, drag our email into your Primary tab.